I’m beginning to put together my girl’s school wardrobe. She still has lots of clothing that she fits, but it’s fun to have some new outfits to wear when starting a new school year. Ideally I would like to focus on making her items that coordinate with each other to make her wardrobe more functional. Her first outfit actually features a reversible skirt (she loves reversible clothing), the So Flippin’ Cute skirt* which is new from Tie Dye Diva*. I made her a size 5, and I used size 3 waist elastic. The skirt’s construction is really fun and simple, making this skirt incredibly quick to sew up. Picking fabric took us the longest! She loves the cat side best with the sweet baby ric rac, but I absolutely love the pockets side! 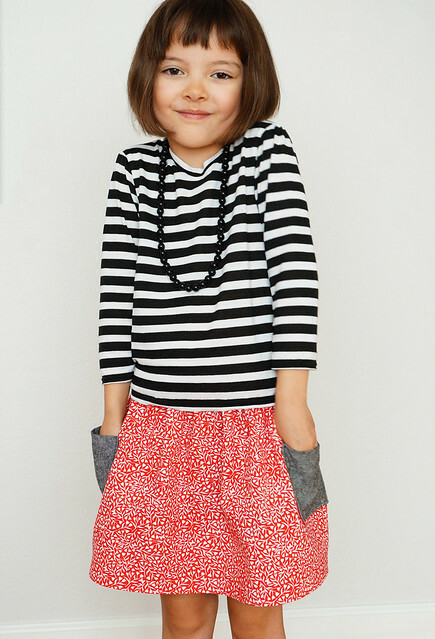 It’s such a cute and classic skirt for girls, and I like that it can have 2 very different looks with just a single skirt. It also doesn’t require a lot of fabric, so much of this skirt was fabric leftover from other projects. We paired it with a striped Garnet top*, and I modified the sleeves to make 3/4 length sleeves for the fall. I love striped tops with fun skirts! I actually really dislike this striped fabric though because no matter what type of needle I use it leaves holes in the fabric. I definitely need to get more striped fabric! I can totally picture this skirt in the fall/winter with tights and boots and a snuggly cardigan or scarf. 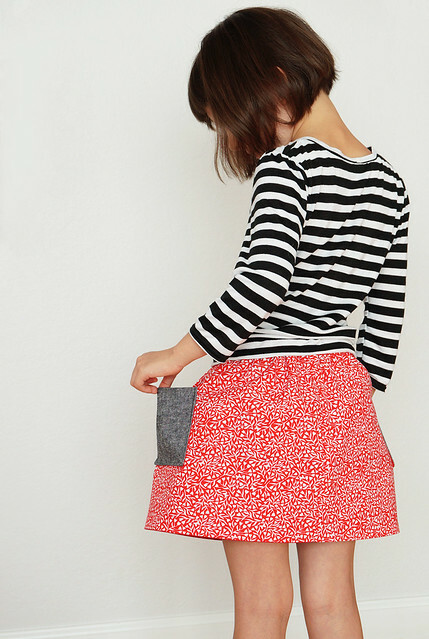 This is such a great basics pattern to build a back to school wardrobe with. It’s on sale through Thursday if you want to grab your copy! Are you doing any back to school sewing? So strange because it still feels like summer to me!